At last, there is good news from Chama! Because of the fire at the Lobato Trestle, the 40th anniversary season of the Cumbres & Toltec Scenic Railroad was under a significant cloud of doubt. Now, the operational shuffle by the Cumbres & Toltec Scenic Railroad appears to be over for the time being. The new arrangement seems the closest to normal, at least as far as the passengers are concerned. In a nut shell, the C&TS has replaced the train on its leg from Chama to Cumbres pass with a motorcoach (also known as a bus) and run Cumbres to Antonito and vice versa with steam. From Antonito to Chama will board a train in Antonito, ride it to Osier and then to Cumbres, where they board the bus to ride to Chama. Those from Antonito to Chama that elect to ride a bus back to Antonito will likely not get a direct route from Cumbres to Antonito, but instead go down with the rest of the passengers to Chama and then back to Antonito. If they went round trip, turning at Osier instead of busing at Cumbres, they would miss the bus ride into Chama, along with the Cascade trestle, Tanglefoot Curve, and Cumbres Pass. Friday's move of engine 484 preceded the move of an entire train of passenger cars aboard trailers from Chama to Cumbres. “My hat is off to our skilled and versatile work crews – who, under the direction of General Manager Marvin Casias, moved an entire passenger train up the pass by flatbed truck,” said Elmer Salazar, C&TSRR Management Company President & CEO. The equipment move was accomplished Friday, after a damage inspection of the trestle indicated repairs might take months rather than weeks. “Marvin made the decision that the equipment move was necessary – and his crews set about moving an entire train by truck, as if it was something they did every other day,” said Salazar. “It was in the finest tradition of mountain railroad men. I couldn’t be more proud of them. I also salute the skilled truckers of Southway Construction CO Inc., of Alamosa Colorado,” Salazar added. “These guys teamed up with our crew to accomplish the ticklish task of loading and unloading the train onto the flatbed trailers." Monday's passengers boarded a bus in Chama for their ride up the same valley that the train travels to Cumbres Pass. On arrival, they stepped aboard the train at Cumbres to continue their journey east. “The romance of the Rockies by steam passenger train is up to its exceptional and thrilling standards with this motor coach prelude,” Salazar concluded. In function, if not in form, the C&TS has taken on the part and practice of its direct predecessor, the Denver & Rio Grande Western Railroad and its affiliate, Rio Grande Motorways. When outages in service would occur in the 1930s and 40s, the D&RGW would divert traffic to Rio Grande Motorways and their buses and trucks. Of note, it was the rubber tire RGM that took what freight there was between Alamosa and Durango fromover the San Juan Extension in the late 1960s while the Rio Grande petitioned the government to abandon the narrow gauge line. Had not the fans of the narrow gauge, both local and distant, stepped forward to preserve at least part of this historic and scenic route, the Cumbres & Toltec would never have existed. Those are the folks I take my hat off to. The clear thinking and quick action by the C&TS may have just saved their season. 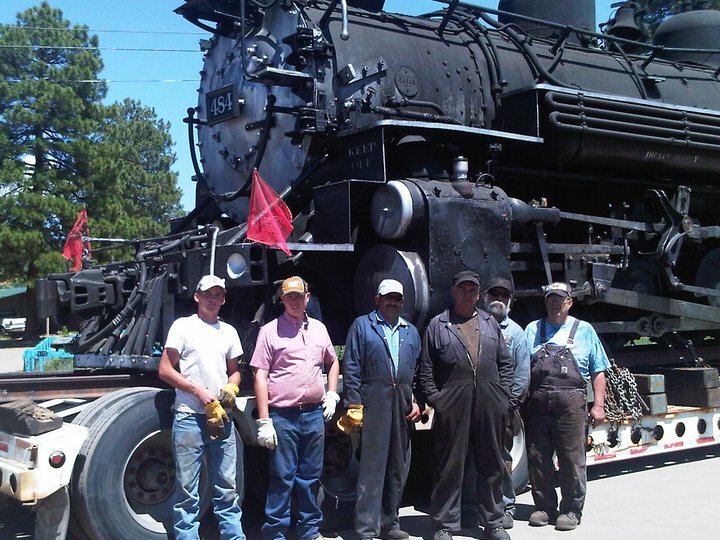 With a little help from the loyal narrow gauge fan base heading to Chama and Antonito for an extra ride this season, they should be back on track in no time. * - Nothing replaces common sense on this blog. Verify all travel arrangements before booking your ticket! We had planned a trip to ride from Chama to Antonito for shortly after the fire happened, and were worried about the service, generally. We needn't have. Everyone was nice, helpful, and did everything they could to accomodate us in making a decision as to which trip to take that most closely resembled our original plan,and make sure we had a great time while we were there. We had the best time ever, and this was our 4th trip on the railroad...OUR HATS OFF TO THE FOLKS HERE! Kimm, Thanks for your comments! I also appreciate What you shared with me only a while ago that you strongly recommend supporting this railroad during their time of difficulty. I agree. If anyone can afford a late summer trip, it's absolutely worth it! I think it's one of the best train rides in the nation, not just the state.